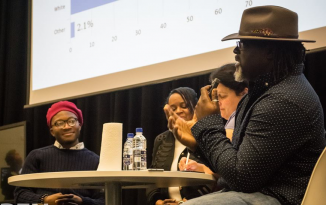 This debate occurred on Tuesday 31st of January at 7.00 in MALT. One quick point, congratulations to Martin Ellis Parry for the preparation and event management work that went into making this debate possible. Congratulations to AGOR-A for putting on a debate that didn’t encounter any silence from the audience when they were requested to ask questions. There were four people on the panel; Rev. John Butler, Professor Stephen Jay Stern, Ann Farr and Michael Brodsky from the Israeli Embassy and the Chairman, Jochen Eisentraut. The debate lasted an hour and a half with quite a few questions asked from the audience on many different topics surrounding the debate such as American and British influence on the conflict, people questioning whether the conflict was an actual international conflict or civil war but also a lot of debate over whether the solution to the Israel/Palestine problem at is a Two State (the U.N. and the West acknowledging that both Israel and Palestine are States in their own right i.e. the sphere of supreme civil power within a given area) or a One State solution where both countries unify into one big country and this super State be the recognised power for both areas . These many topics were given answers by the panel with a lot of argument occurring from both sides of the panel, one problem that I could see was that members of the audience ended up speaking over the members of the panel when the members of the panel were giving answers to questions asked, which I find quite rude and made the debate seem very unfriendly and Professor Stephen Jay Stern did comment on this by saying that he wouldn’t have encountered the level of hostility to him or the Israel’s in a debate in America. There was a lot of strong opinion from a group of anti-Israeli people who in my opinion just turned up for the debate not to listen but to speak over the Israeli representative. The next AGOR-A debate will be, “Does the future have a Euro?” which will be scheduled shortly.